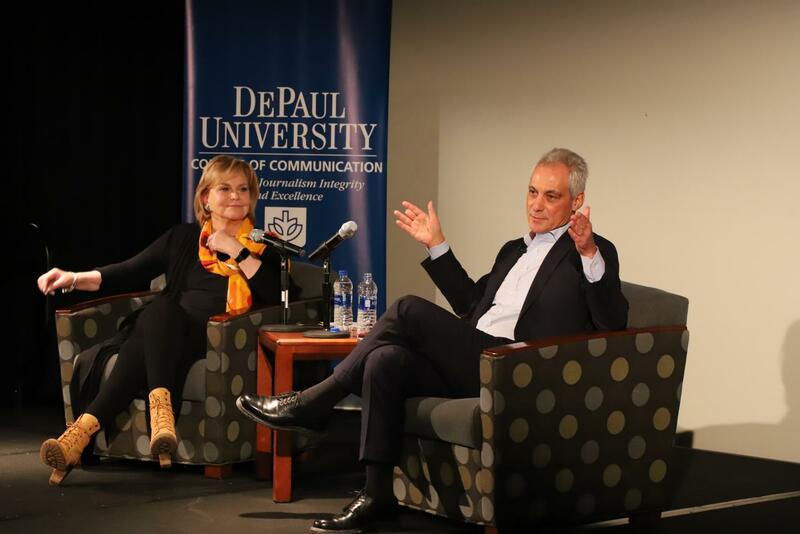 Mayor Rahm Emanuel joins journalism professor Carol Marin on Tuesday, Jan. 28 to speak to students about the relationship between journalists and public officials. The City of Chicago was battening down the hatches in preparation for record-freezing temperatures, but Mayor Rahm Emanuel wasn’t afraid to crack a joke. “Is anybody cold?” he chuckled as he entered an event for journalism students at DePaul University. 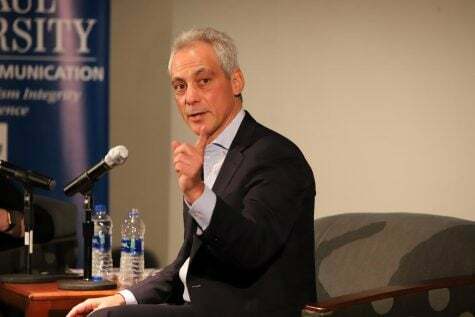 With three months left as mayor, Emanuel joined on Tuesday morning for an interview with NBC’s Carol Marin at DePaul University’s Center for Journalism Integrity and Excellence. Quickly going into an off-the-record session, the mayor then taped a podcast segment with Marin before launching into a Q&A with student journalists. Emanuel didn’t shy away from reflecting on what he hopes his mayoral legacy looks like. He brought up his controversial record on Chicago Public Schools, where in 2013 he closed 49 schools and cut budgets across the board, explaining that despite hardships, he was able to pull a bleeding education budget up into the current surplus. Mayor Rahm Emanuel addressing students and faculty in the lower concourse of the Maggie Daley building on DePaul’s Loop campus. Perhaps the most affecting part of the event came at the close when Marin presented Emanuel with a gift from DePaul: framed photos from the NBC archive of a 16-year-old Emanuel protesting neo-Nazis marching on Skokie in 1977. “Be objective, but if you’re going to be subjective, be upfront that you’re going to be subjective,” Emanuel said. The mayor steered away from a question on some current news related to DePaul when asked about the recent federal lawsuit concerning alleged election fraud announced by DePaul freshman and Aldermanic candidate David Krupa. The whole event was meaningful for Mike Wzorek, a third-year communications and media studies major. Getting to see the mayor in person was also worthwhile for Dahodwala. “I was here for a class just to get extra credit, but now I don’t even care because that was really worth it,” Dahodwala said. When time ran out, the mayor had to return to his regular duties. Later that day, the governor of Illinois issued a disaster proclamation for the dangerously cold weather centered in Chicago. Emanuel said earlier in the day that the forecast was “not to be taken lightly,” and could be life-threatening. There were bigger things to worry about as he stared down what would be a long few days, but as he left the DePaul event, the framed photos of a younger Emanuel stayed in his hand.